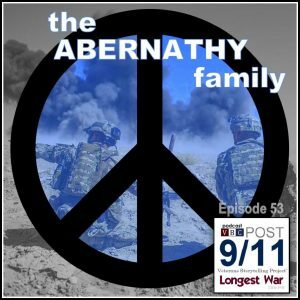 On episode 53 of Longest War: The Post-9/11 Veterans Podcast, we talk with three generations of the Abernathy family of Pittsburgh, Pennsylvania, about serving in the army during WWII through the War in Iraq, geo-political causes of war, leadership through love, and war’s impact on humanity. Four generations of the Abernathy family have served in every major armed conflict and the Cold War since World War I. Thomas Cross served as an army infantryman during WWII, being among the first Americans to enter Germany. Thomas’ daughter Denise joined the army in the 1970s and served during the height of the second great period of the Cold War. Thomas’ grandson, Father Paul Abernathy served with the army during the initial invasion of Iraq in 2003. The Abernathy family’s personal experience with war leaves them uniquely qualified to judge its usefulness and ultimate affect on America, nations around the world, and humanity itself. And they conclude: There is no justification for war. This episode was recorded June 9, 2018 in Pittsburgh, Pennsylvania. Host: Nick Grimes. Guests: Thomas Cross, Denise Abernathy, Fr. Paul Abernathy. Audiography: Kevin Farkas/The Social Voice Project. Music (available on SoundCloud.com): WOWA (“They Say”), Alexander Nakarada (“Jack the Lumberer”). ©Longest War: The Post-9/11 Veterans Podcast. Veterans Breakfast Club. All rights reserved.